Simple compass display, using two I/O pins. Obviously it's a simple matter to achieve this with four I/O pins, with one LED connected to each line. It's also possible with three I/O pins; using Charlieplexing allows you to control up to six LEDs. However, I needed to be able to do it with only two I/O lines. On the AVR micros each I/O pin has three possible states: high, low, and input (high-impedance), so in theory with two I/O pins there are 3 x 3 = 9 states, so it should be possible to achieve what I want. Controlling two LEDs from a single I/O pin. Taking the I/O line high or low turns on each of the LEDs in turn; programming the I/O line as an input leaves both LEDs off. By arranging two pairs of LEDs connected like this in a square you can achieve the eight compass directions as required. 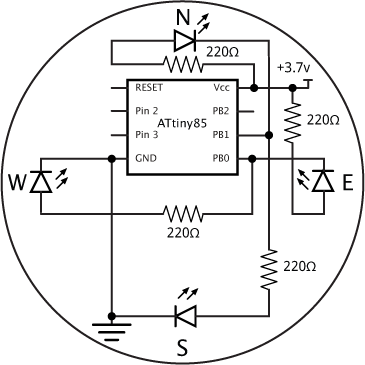 Circuit of the simple compass display. The circuit reflects the layout I used on the prototyping board, with the LEDs arranged like the points on a compass. I used bright blue LEDs from Adafruit . Note that these LEDs are very bright – I soon started getting spots in front of my eyes while testing the circuit, so increased the resistors to 1kΩ to reduce the brightness. I've also tested it with white LEDs. ^ Super Bright Blue 5mm LED on Adafruit.